Solo marks the end of an era. It turns out that C-3PO won't be featured in the upcoming standalone movie centered on Han Solo. This marks a first in the history of the franchise, as C-3PO has appeared in every single Star Wars movie to date, even making time for a brief cameo in Rogue: One a Star Wars Story. Disney and Lucasfilm are breaking tradition with this one. Warning: very minor spoilers ahead for Solo: A Star Wars Story. Co-writer Jon Kasdan, who wrote the movie with his dad Lawrence Kasdan, writer of The Empire Strikes Back, recently confirmed that C-3PO isn't going to be in the movie in a recent interview. However, he did reveal that Anthony Daniels, the actor who brings the beloved droid to life, did manage to sneak himself into the movie as a different character. If you'd rather not know how he shows up or who he shows up as, skip over the quote. If you don't mind, here's what Kasdan had to say when asked if C-3PO would be making an appearance. "No, but Anthony Daniels is in the movie as a different character. In the Papillon type offshoot story, the Wookiee that helps them escape, Chewbacca's best friend, is played by Anthony Daniels, and beckons him to join them as they escape on a different ship." We may not be getting C-3PO in Solo, but having Anthony Daniels play a Wookiee sounds like a nice tradeoff. It's worth noting that Jon Kasdan doesn't say anything here about R2-D2. While C-3PO and R2 often come as a pair, it hasn't yet been ruled out completely that we may see the blue and white astromech droid in the movie. Even if it's not R2-D2, there are surely opportunities for familiar Star Wars cameos. 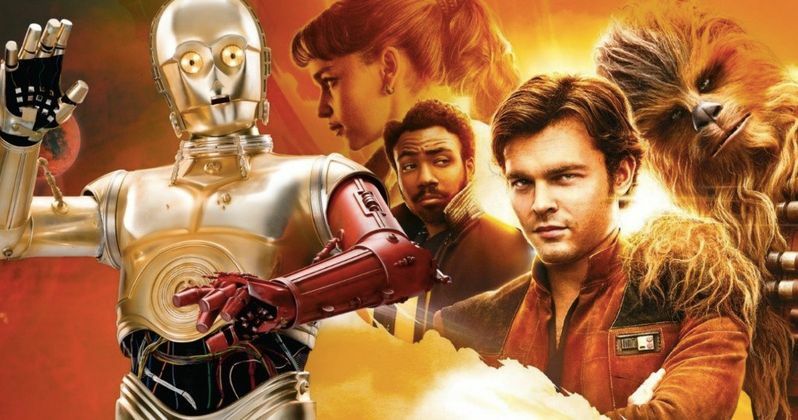 C-3PO or no C-3PO, it sounds like Solo: A Star Wars Story may come as a bit of a pleasant surprise for many. The movie had a tumultuous production, with Ron Howard stepping in to reshoot the vast majority of the movie once Phil Lord and Chris Miller were fired. Couple that with the fact that many fans didn't necessarily want to see a young Han Solo movie in the first place and this project has a lot going against it. That said, the reactions from the premiere last week were almost entirely positive. This may well be a nice change of pace after the divisive experience that was The Last Jedi. Solo: A Star Wars Story arrives in theaters on May 25 and looks like it's going to rake it in at the box office. Disney and Lucasfilm have had a lot of luck with their December release strategy for Star Wars movies, which they're going back to with Star Wars 9 next year, but it seems as though summer will work just as well for a galaxy far, far away. It also sounds like they can work just fine without C-3PO. This news comes to us courtesy of Uproxx.